Sergeant Major Herman was born in Connellsville, Pennsylvania. In June, 1988, he enlisted in the United States Marine Corps and attended 1st Recruit Training Battalion, MCRD Parris Island, South Carolina. After graduation, he was assigned to Infantry Training Battalion, Camp Geiger, North Carolina for MOS school. After graduating from MOS school, he was assigned to 2nd Battalion, 8th Marine Regiment, 2nd Marine Division located aboard Camp Lejeune, North Carolina for duty as a Machine Gunner (0331). During his six year tour, he deployed several times, most notably in support of Operation ENCOURAGE HOPE and FORCE HOPE in Northern Iraq. In May of 1994, he reported to Ground Defense Security Force Company, Guantanamo Bay, Cuba for duty as Platoon Sergeant. In May of 1995, he received orders to Drill Instructor School, Parris Island, South Carolina. During this tour, he served as Drill Instructor, Senior Drill Instructor and Operations Chief for Lima Company, 3rd Recruit Training Battalion. In 1997, he was selected as the 3rd Recruit Training Battalion Drill Instructor of the Year and was meritoriously promoted to Staff Sergeant. In 1998, he received orders to Marine Barracks, 8th and I, Washington, DC. During this tour, he served two years as the Platoon Sergeant for the United States Marine Corps Silent Drill Team. In 2000 he received orders to First Fleet Antiterrorism Security Team (FAST) Company, Marine Corps Security Force Battalion where he served as Platoon Sergeant, Operations Chief, Company Gunnery Sergeant, and Senior Enlisted Advisor. During his tour, he deployed several times including deployments in support of Operation SOUTHERN WATCH and Operation IRAQI FREEDOM. After being selected for First Sergeant in 2004, he received orders to Inspector-Instructor Duty, 1st Battalion, 25th Marines, 4th Marine Division located in Ayer, Massachusetts, where he served as the Site, Headquarters, and Weapons Company, First Sergeant. In 2007, he received orders to serve as the First Sergeant for Bravo Company, Marine Wing Communications Squadron 38, Marine Air Control Group 38, 3D Marine Aircraft Wing and deployed in support of Operation IRAQI FREDDOM. In May of 2009, he was promoted to his current rank and assumed duties as the HMM-161 Sergeant Major. During this tour he earned the Naval Aerial Observer/Gunner designation. In October of 2009, the unit was re-designated as VMM-161, the first West Coast V-22 Osprey Squadron. Sergeant Major Herman assumed duties as the HMH-466 Sergeant Major in December of 2009 and deployed to Afghanistan in support of Operation ENDURING FREEDOM. In February of 2011, he was assigned as the Sergeant Major of Recruiting Station Charleston, West Virginia where he served until September 2013. In October 2013, he was reassigned as the Sergeant Major of Expeditionary Warfare Training Group, Atlantic (EWTGLANT). 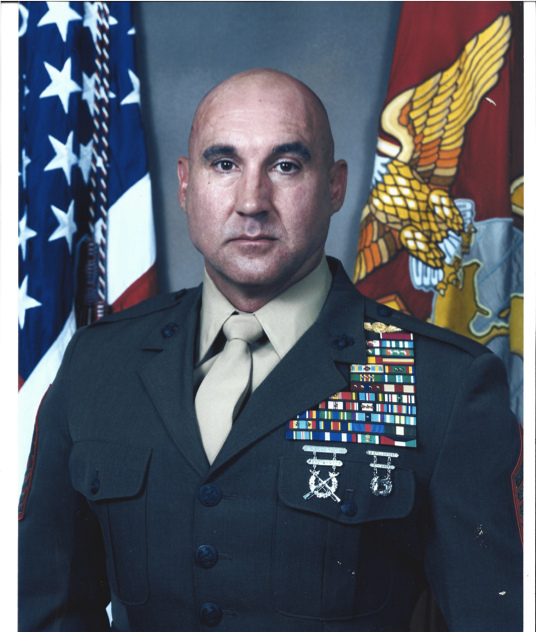 Sergeant Major Herman’s personal decorations include the Legion of Merit, Meritorious Service Medal with three gold stars, Joint Service Commendation Medal, Navy and Marine Corps Commendation Medal with two gold stars, Navy and Marine Corps Achievement Medal with three gold stars, Combat Action Ribbon and the Military Outstanding Volunteer Service Medal. Sergeant Major Herman holds a Master’s Degree from Marshall University in Leadership Studies and was the honor graduate at Amphibious Reconnaissance School (ARS).